I’m up in the flight levels today, but not at the controls of an aircraft. Instead, along with approximately 261,000 Australian air travellers, I’m a passenger. I won’t lie; I find that a little unsettling, as I suspect most pilot-passengers do. I suspect pilots don’t make good passengers for the same reason doctors don’t make good patients—it’s something to do with control issues (no pun intended). At least the doctor/patient can eyeball their doctor-on-the-day and speak up if things go wrong. The passenger/pilot is at least several rows back and locked out by a hijacker-proof door. All I can do as a passenger is put my calm-face on (my daughters are watching) and look out the window … or down at my watch. Handily, it’s got an in-built compass and barometer which means I can work out if we’re heading in the right direction and whether the cabin is pressurising properly. Sad I know. Especially because deep down I know the score: if you as the pilot make a serious mistake behind that locked door there’s not a thing I and my watch can do about it. So I’m imagining some accident-causing scenarios as I contemplate my de-piloted status. Engine fire? Tick. Oxygen bottle exploding mid-flight? Tick. Mid-air collision? Yep, tick that one as well. But the scenarios I’m thinking of the most are from the same species of accident—a species that’s caused 80 per cent of air transport fatalities. Here I sit 23 rows back, de-piloted, staring back and forth at my barometer-watch and out my dodgy little window with three graphic accident reports stewing in my head. Like I said, sad really. My mind wanders until I’m in the jump seat, not on this flight but on three fateful flights, smooth and dull as this one until the critical moments. And you, reader, are in the command seat. Conscious of the importance of keeping a sterile cockpit, I’m only allowed two words, but they should be all I need. Wait a minute … air traffic control is warning of a thunderstorm at the airport with visibility currently at 4000 metres in heavy rain. I look forward anxiously but you guys seem to be all over it. You discuss the storm and the option to go around during final approach. You also decide to change the autobrake setting from ‘2’ to ‘3’. You look out the window at the storm. I can tell you’ve seen this before. It’s pretty common for Bangkok at this time of year. You, as the captain, suggest to the flying pilot it’s time to reduce speed. By 3000 feet the airspeed is down to 200 knots and the autopilot has nailed the glide-slope beautifully. A short time later the landing gear is down and we’re at 2200 feet and 182 knots. You de-select the autopilot and auto-throttle and, as the brassy riff of the disconnect alarm sounds, select flaps to 20 degrees. Visibility is still good but the thunderstorm is now really close. It’s reassuring then to hear the tower’s radio call about a preceding aircraft that’s just landed. ‘Runway wet … braking action reported by Airbus 33 as good’. At 770 ft and 166 knots I hear the first officer comment, ‘The aircraft doesn’t want to slow down’. You, as the captain, acknowledge and I’m reassured by your bedside manner. You don’t seem too concerned. At 200 feet and 164 knots we enter heavy rain—really heavy rain. It’s so loud it can be heard over the slipstream and the engine noise. The windscreen wipers are doing their best but it’s like the air has suddenly rebelled at being a gas and transmuted into great curtains of water. ‘You’re getting high now … you happy?’ you say. ‘Ah … yes,’ the first officer replies. I can tell he’s not happy. I wonder if I might need my two words after all. ‘Get it down, get it down, come on you’re starting your flare,’ says the captain. We seem to be ballooning down the runway and we are at 169 knots (20 knots above target speed) and 30 feet above the ideal threshold height. It’s time to use my words. That’s it. My two words. Simple really. I know you’re super-busy now and I won’t say it again but I, my wife and my three daughters would really appreciate it if you went around. You see out of all the approach and landing accidents I’ve studied, nearly every single one would have been prevented by a simple go-around. That’s the captain. Good call I think to myself. The FO advances the thrust levers just as the 747 touches down. The visibility increases and we can see the end of the runway. But then there’s a distinct clunk as the thrust levers hit the idle stop. On seeing the improved visibility the captain has evidently decided to abort the go around … But he hasn’t announced it and he’s unintentionally missed the number one engine lever. We’re now halfway down the 3.7 km runway and we are still at 153 knots. Worse, because the number one engine is above idle-speed, the autobrakes have disengaged. Even when the FO pulls back the number one engine and even with vigorous manual braking it’s too late: we’re off the end of the runway at 96 knots and through a part of the ILS antenna structure. Boggy soil helps slow us down and we eventually come to rest with our nose on the perimeter road. I look around. My family and I, as well as nearly 400 passengers, are all OK. We’re thankful but we wonder where it all went wrong. On our second flight of imagination we’re going to have even more to wonder about. You’re the non-flying first officer of a Boeing 737–300 and once again you’ve got that annoying bloke (me) with his wife and three daughters, for good measure, behind you. I’m not saying much this time. I don’t want to pressure you. We departed two hours behind schedule for Burbank, California and I can tell you’re busy. I’m pretty sure, though, you’re happy in the knowledge I’ve got my two power words ready to go. That’s the captain. I get a little more anxious but at least the speed is coming back. It’s now at 190 knots. It’s the ground proximity alert. Even as a passenger I can see we’re fast, high and descending rapidly—with a 20-knot tail wind and that ain’t a good thing. Surely we’ll obey the electronic plea to pull up? ‘Flaps 40’, says the captain. But it’s not alright. We cross the threshold at 182 knots—way above the target speed. Time for my two imaginary power words because evidently you, as the FO, and non-flying pilot are gonna let this happen. It’s our third flight and by now you can probably see a pattern—runway overruns. But this one will be different. There will be deaths. You are the non-flying pilot and the first officer. We’ve rolled out onto final at Adisucipto International Airport, Yogyakarta, Indonesia, and we’re not even close to being ‘in the slot.’ We’re 10 miles out, 1500 feet above the initial approach fix and doing 283 knots. Despite this, the captain calls for flaps. We’re way above the flap limiting threshold. You, as the first officer, wisely disincline. The ground proximity alert begins to sound. It repeats another 14 times during the approach. The co-pilot unassertively calls for a go around, but the captain either ignores it or is task saturated and doesn’t hear it. We cross the threshold at 235 knots, 87 knots faster than the target speed. It’s definitely time to use my two words but the co-pilot beats me to it. We run off the end of the runway at 110 knots (200 kph) crossing a road and an embankment before ploughing to a stop in a rice paddy. The aircraft’s back is broken, and leaking fuel quickly ignites into a conflagration which destroys the aircraft, killing 20 of the passengers. Even in my imagination I don’t want to look around—those 20 may include some or all of my family. Garuda Flight GA200 at Adisucipto Airport in 2007. In all three overruns, albeit to different degrees, the dynamics of channelised attention, fixation and crew resource management (CRM) were found to be causal factors. There were others including, in the case of QF1, deficient operating procedures for wet runways, cramped air traffic control vectors at Burbank, and an incredibly steep cockpit gradient for the Garuda flight. All these factors are well worth a more detailed reading at the links above but here’s the really sobering thing: the knowledge of such things isn’t new now and it wasn’t that new for the accident crews. In the 1990s, thanks to ICAO-initiated approach and landing research (including research into controlled flight into terrain), it was discovered about 80 per cent of air transport fatalities occur during approach and landing. Out of this research came a variety of training programs to address the issue. But despite this, aircraft still slammed into the ground and/or overran runways. If you do, I’d really like to eyeball you afterwards and say something to you. Simple explanation really, human error, you cannot stop it you cannot control it, it’s a part of flying & it’s called risk! All the rubbish feel good crap that is CRM, human factors HR people you will never get on top of it. Fully serviceable planes & pilots will continue to fly into the ground, it’s just what humans do, make mistakes! Sure human error can never be eliminated but it can be controlled through education as young aviators start their careers and hopefully with attitude adjustment of the older ones who think ‘it’s a load of crap’. I hate to say it but with your attitude you are an accident waiting to happen. Why do you aviation is so safe now? Not just because of better engineering but because of the development of HF and CRM training. I only hope you are not in a position where attitude rubs off on other impressionable aviation professionals. I have witnessed first hand the damage attitudes such as yours can influence the culture of a workplace. 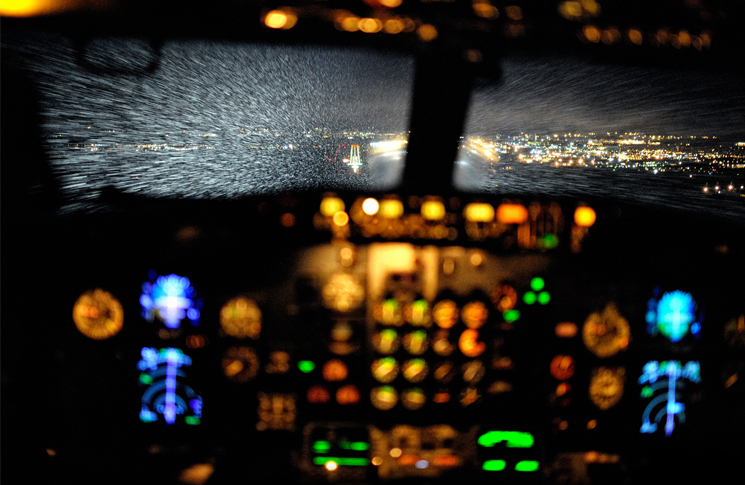 We have the term minimums or decision height as the visibility “Go Around” call decision time for mandatory action and follow through on a missed instrument approach …. this should also include strict laid down operating procedures by the Carriers Pilot Flight Operations Manual, for the mandatory “Go Around” call to also apply to proper V Ref Approach Control Speed, and on passing the MM, making it pending there… and if not Vref established +- 5kts by minimums DH time and IM transit time …. a Mandatory action “Go Around” Command Call is executed and followed through, regardless of any mitigating factor immediately presenting. Human Error/ Pilot Error ….. yes …..that is its Subjective trait. CRM is inherently Work Safe SAFETY Objective in nature … and its fixed Operating Procedures thus implemented designed to prevent this Human Error and make that call decision for you first! Well done Adrian. A well written, well researched and informative post. I can certainly relate, as in late April I managed my first runway over-run at Cessnock, NSW after almost 12,000 hours of flying. Despite being a single pilot op, it was quite embarrassing (with hindsight) despite no damage. I actively thought about going around up until the point where it was too late, whereas with less experience I would have made the D earlier. The extra 5 minutes does no harm. Keep up the good work. Chris. I’m a non heavy pilot with a lapsed medical, I average 6 international flights per year in cattle class. Adrian,s scenarios are over runs. Well in cattle class I look about the cabin and think, mmm, full pax, and an up there take off weight. I look at the wings and am reassured when I see leading edge slats extended and I guess about 10* flap. So what can I do from there on, nothing at least the aircraft is on it’s best chance to get into the air and on it’s way. I never fail to check the wings, what if I noticed that these high lift apparatuses were not extended, and started a commotion trying to get cabin crews attention, catch 22, 1. die in a take off failure, 2. get a blanked over my head and and escorted of the flight and never be allowed to fly again, 3 hopefully save by the Black boxes and be exonerated.